As part three of our series, The Beatles Interview Series, we have for you, a press conference The Beatles held in Chicago in 1964 after someone in their camp decided to land the plane in a more secluded spot at the the airport, away from, and to the disappointment of, the large crowd that had spent many hours waiting on the boys' arrival. According to Jay Spangler of The Beatles Ultimate Experience, "The Beatles felt they were being incorrectly blamed for the incident by reports in the Chicago news, and sought to set the record straight. This press conference was held at the Stockyards Inn on September 5th 1964 before the Beatles performance at Chicago's International Amphitheatre." PAUL: "It was yesterday we heard about it. Umm, we heard that we had to land at a secret spot on the airfield. I'm not sure whether it happened or not today. Did it? Was it a secret place today?" JOHN: "It was a different one from the one we were meant to land at, but luckily somebody found out, you see, so somebody did see us." PAUL: "Yeah. The only thing is, you know, if we come in sort of secret..."
RINGO: (regarding the reporter) "I don't think he's getting it, you know. He's looked away. Are any of these (microphones on) in the P.A.? Then you can tell him." PAUL: (laughs) "If we come in secretly and there's people there to see us at another place..."
Q: (rudely) "Can you ALL speak?" JOHN: "Yeah, but we can't all speak at once, can we? And as he's answering the question, what's the point of us all butting in?" JOHN: "'Cuz you're finding it hard enough to understand him." Q: "What was your impression of the Chicago skyline?" JOHN: "Well, it looks like any other, you know." Q: "We thought it was rather distinctive." JOHN: "Oh, well... each people... you know-- Everybody likes their own hometown, don't they." Q: "You've been on this tour for quite some time now in America, and I'm sure you've learned quite a bit. If you had it to do again, and chances are you're planning that, what would you change, if anything?" JOHN: "Well, we'd probably just go to different cities-- not go to the same places we've been to." Q: "Are you satisfied with the security? Are you satisfied with the arrangements that were made?" JOHN: "Yeah, it's been quite good, except for the slip-ups where we don't see the fans." Q: "And you say this is not your fault." JOHN: "It's never... we never arrange anything. The only thing we arrange is what numbers we're gonna sing." Q: "Whose fault is it?" JOHN: "I don't know. It could be-- it's different people. Half the time it's the police or half the time it's-- I don't know, you know. There's always somebody that does something." Q: "Don't you think it's done for your good?" PAUL: "But see, if anybody thinks..."
RINGO: "They think it is." JOHN: "They think it is, but it isn't. It's harmed us all in the end anyway because the poor fans that have been there for twelve hours think, 'Why aren't they coming to see us.'" PAUL: "See, the worst thing from our point of view is that it looks as though it's us who's done it, too. And, uhh... I was watching the TV last night, and on the news they just showed all the fans sort of disappointed. And they didn't actually say anything about who's fault it was, but they just said, 'Police commissioner so-and-so said the Beatles WANTED to land there.' And they said no more. That really sounded as though we'd said, 'Please don't let us amongst all those fans. We hate them,' which is completely untrue, you know. We definitely asked to meet them or at least drive past 'em, and they told us, 'No.'" 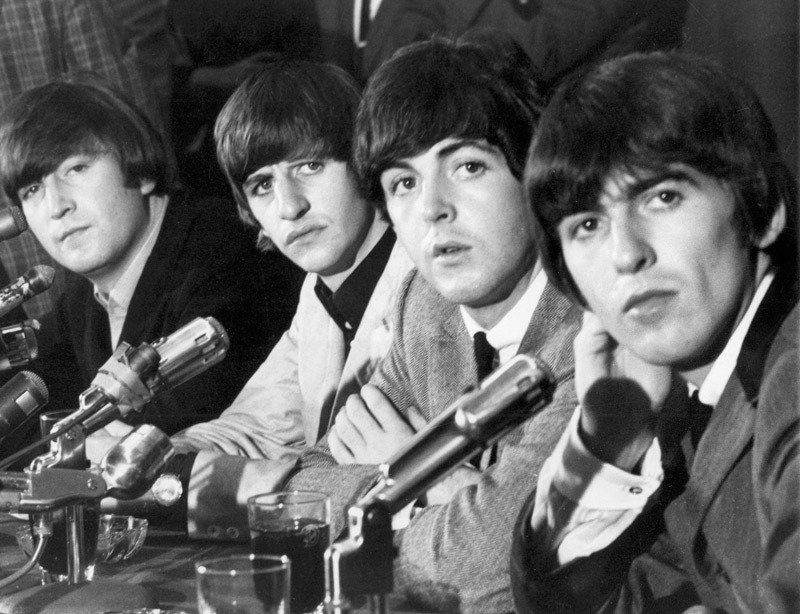 Beatles at a press conference in 1964. Q: "Quite a few of the girls are concerned about John's throat. How is it today?" JOHN: "Well, it's better than it was yesterday. It's not ninety percent, but it's..."
Q: "Have you fellas given any thought to what you're going to do when the bubble breaks, so to speak?" JOHN: "Well, we're gonna have a good time." GEORGE: "We never plan ahead." Q: "How about your retirement or buying into a big business..."
JOHN: "We already are a big business, so we don't have to buy into another one." Q: "Well, I'm talking about if this business should wane slightly." GEORGE: "We'll start planning when it starts to wane, but at the moment we'll just let it go on as it is." PAUL: "Anyway, yeah. We've never made plans for anything, so there's no real reason to make plans now." Q: "Well, in your particular case, do you think you'll go into songwriting as a business?" PAUL: "I should imagine that John and I..."
JOHN: "Well, it is. Paul and I make more money out of songwriting than we do out of doing everything else. So we'll just carry on with that, probably." Q: "What do you do with all your money?" JOHN: "Put it in a bank... or the accountant looks out for it. We have people to look after it." Q: "Are you just going to save it?" JOHN: "Well, I don't know." JOHN: "He does tricks with it. That's his job." GEORGE: "And anyway, it wasn't legally ours until we paid tax on it. So the money's got to keep in the accountant's place until he's paid tax." PAUL: "At the moment it's pretty hard to spend it, you know. We all came away with about a hundred and fifty dollars each." JOHN AND PAUL: "And we've still got it." PAUL: "I haven't spent a penny or a cent." Q: "There was a report today that amongst your fans is the Internal Revenue Service." Q: "They're supposed to be following you around. Have you noticed them around anywhere?" JOHN: "I haven't seen any of 'em. No." PAUL: "Now, mind you, you gotta pay it. But umm..."
Q: "What do you think of the American girls as opposed to British girls?" GEORGE: "They're the same only they speak foreign-- I mean, with a different accent." PAUL: "They're all good, you know." GEORGE: "They're the same everywhere, basically, aren't they. They just talk different." Q: "Alot of the girls seem to feel that you prefer the celebrity-type woman better than the average girl." JOHN: "That's the first time we've heard it. I mean, are you making that up, or does somebody say that?" Q: "No, I've heard it before." PAUL: "Well, John's married to a non-celebrity, so there you go." Q: "Have you dated any American girls since you've been here?" PAUL: "Yes, I mean... you know, dated 'em but..."
GEORGE: "We can't really, you know. On this tour we don't get much time, you know, to do anything except go to each place and perform." JOHN: "I haven't even seen any celebrity girls. Have you?" GEORGE: "No, I haven't seen any." Q: "Will you tell us why you think you are so popular?" JOHN: "We don't think about it. We get asked that, you know-- somebody asks us that everyday, and we've no answer." Q: "Do you want to go to the Soviet Union for a tour?" Q: "Where would you like to go that you haven't gone yet?" Q: "You don't like the U.S.?" JOHN: "I mean, we haven't been home for months-- so you say, 'Where do we wanna go?' We'd like to go home next." PAUL: "But see, you're trying to put answers into our mouths. We like the U.S., I mean..."
GEORGE: "We wouldn't be here..."
PAUL: "We wouldn't be here if we didn't. We've been here once before, we liked it, and we came back. It's a great place, you know, but naturally you get homesick. You would if you were in England for a long time..."
Q: "Do you think the kind of music you're doing was fostered here and became popular over there, and consequently you made it popular again back here?" JOHN: "The only difference is, we write it now. It's the same music." Q: "Do you boys sense that the American boys might be a little jealous of you?" JOHN: "Do you mean the teenage boys or..."
JOHN: "No. I mean-- they buy us." PAUL: "Not the ones we've met, anyway, you know. They're not." JOHN: "There's quite a few of them waving at airports and things."